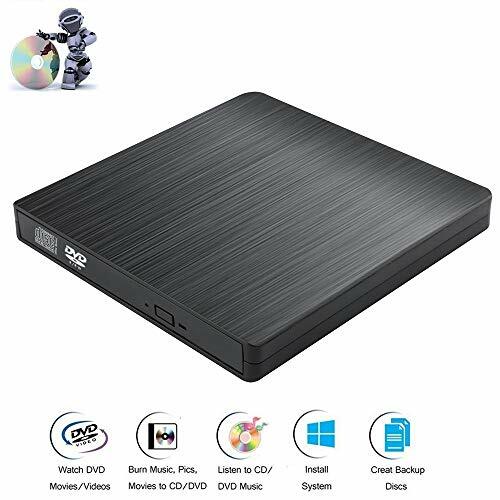 External CD Drive, Portable USB 2.0 CD/DVD Drive Slim Optical cd ROM Drive No Need Install Drive for Laptop Windows XP/vista/7/8/10 MacOS System(Black) by Dainty at Pacs BG. Hurry! Limited time offer. Offer valid only while supplies last. 【 GREAT COMPATIBILITY】The external CD drive works with Windows 98 / SE / ME / 2000 / XP / Vista / Windows 10/8/7, all Version MAC OS. Specially designed for Apple Samsung ASUS HP Dell Sony Acer and other Macbook, Ultrabook, Netbook or Laptop PC without drive hardware. 【High Speed/Stable & Durable】Adopt full-function original machine core, the speed of DVD read disk increases 70%, fully support CD/VCD/DVD all size.EDA voltage stabilization system, intelligent control of voltage and current, avoid excessive voltage cause CD/DVD drive cannot be use or damage the computer.Increase vibration-proof function, effectively reduce noise.Anti-skid pad design to prevent the product from slipping down and damage. 【Fashionable Design】Brushed texture shell brings touch and sight enjoyment. It is portable for traveling with your laptop thanks to its small size. With a lightweight body with brushed surface and an embedded USB cable mean the CD drive can be slipped in your travel bag, and hooked up at any time. 【WARRANTY AND SUPPORT】 100% RISK FREE PURCHASE - Our external CD drive adopt 100% durable brand new DVD loader which is more stable. We believe in the quality that we are backing it up with lifetime warranty. Feel free to contact us, we would solve the problem soonest for you. Support replacement and resent with 24 hours friendly customer service. If you have any questions about this product by Dainty, contact us by completing and submitting the form below. If you are looking for a specif part number, please include it with your message.